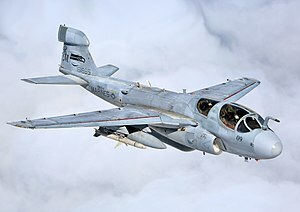 The Northrop Grumman (formerly Grumman) EA-6B Prowler is a twin-engine, four-seat, mid-wing electronic-warfare aircraft derived from the A-6 Intruder airframe. The EA-6A was the initial electronic warfare version of the A-6 used by the United States Marine Corps and United States Navy. Development on the more advanced EA-6B began in 1966. An EA-6B aircrew consists of one pilot and three Electronic Countermeasures Officers, though it is not uncommon for only two ECMOs to be used on missions. It is capable of carrying and firing anti-radiation missiles (ARMs), such as the AGM-88 HARM missile. The Prowler was in service with the U.S. Armed Forces from 1971 until 2019. It has carried out numerous missions for jamming enemy radar systems, and in gathering radio intelligence on those and other enemy air defense systems. From the 1998 retirement of the United States Air Force EF-111 Raven electronic warfare aircraft, the EA-6B was the only dedicated electronic warfare plane available for missions by the U.S. Navy, the U.S. Marine Corps, and the U.S. Air Force until the fielding of the Navy's EA-18G Growler in 2009. Following its last deployment in late 2014, the EA-6B was withdrawn from U.S. Navy service in June 2015, followed by the USMC in March 2019. 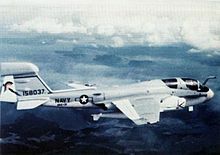 The EA-6A "Electric Intruder" was developed for the U.S. Marine Corps during the 1960s to replace its EF-10B Skyknights. The EA-6A was a direct conversion of the standard A-6 Intruder airframe, with two seats, equipped with electronic warfare (EW) equipment. The EA-6A was used by three Marine Corps squadrons during the Vietnam War. A total of 27 EA-6As were produced, with 15 of these being newly manufactured ones. Most of these EA-6As were retired from service in the 1970s with the last few being used by the Navy with two electronic attack "aggressor" squadrons, with all examples finally retired in the 1990s. The EA-6A was essentially an interim warplane until the more-advanced EA-6B could be designed and built. 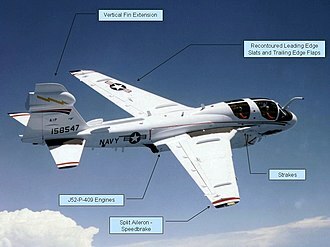 The substantially redesigned and more advanced EA-6B was developed beginning in 1966 as a replacement for EKA-3B Skywarriors for the U.S. Navy. The forward fuselage was lengthened to create a rear area for a larger four-seat cockpit, and an antenna fairing was added to the tip of its vertical stabilizer. Grumman was awarded a $12.7 million contract to develop an EA-6B prototype on 14 November 1966. The Prowler first flew on 25 May 1968, and it entered service on aircraft carriers in July 1971. Three prototype EA-6Bs were converted from A-6As, and five EA-6Bs were developmental airplanes. A total of 170 EA-6B production aircraft were manufactured from 1966 through 1991. The EA-6B Prowler is powered by two Pratt & Whitney J52 turbojet engines, and it is capable of high subsonic speeds. Due to its extensive electronic warfare operations, and the aircraft's age (produced until 1991), the EA-6B is a high-maintenance aircraft, and has undergone many frequent equipment upgrades. Although designed as an electronic warfare and command-and-control aircraft for air strike missions, the EA-6B is also capable of attacking some surface targets on its own, in particular enemy radar sites and surface-to-air missile launchers. In addition, the EA-6B is capable of gathering electronic signals intelligence. The EA-6B Prowler has been continually upgraded over the years. The first such upgrade was named "expanded capability" (EXCAP) beginning in 1973. Then came "improved capability" (ICAP) in 1976 and ICAP II in 1980. The ICAP II upgrade provided the EA-6B with the capability of firing Shrike missiles and AGM-88 HARM missiles. The added modifications increased the aircraft gross weight approximately 2,000 lb (910 kg) and shifted the center of gravity 3% MAC aft of the baseline EA-6B. In previous models, when operating at sustained high angles of attack, fuel migration would cause additional shifts in CG with the result that the aircraft had slightly negative longitudinal static stability. Results of flight tests of the new configuration showed greatly improved flying qualities and the rearward shift of the CG had minimal impact. Designed for carrier-based and advanced base operations, the EA-6B is a fully integrated electronic warfare system combining long-range, all-weather capabilities with advanced electronic countermeasures. A forward equipment bay and pod-shaped fairing on the vertical fin house the additional avionics equipment. It has been the primary electronic warfare aircraft for the U.S Navy and U.S. Marine Corps. The EA-6B's primary mission is to support ground-attack strikes by disrupting enemy electromagnetic activity. As a secondary mission it can also gather tactical electronic intelligence within a combat zone, and another secondary mission is attacking enemy radar sites with anti-radiation missiles. The Prowler has a crew of four, a pilot and three Electronic Countermeasures Officers (known as ECMOs). Powered by two non-afterburning Pratt & Whitney J52-P-408A turbojet engines, it is capable of speeds of up to 590 mph (950 km/h) with a range of 1,140 miles (1,840 km). VAQ-131 was the second squadron to deploy to Vietnam, in September 1972. 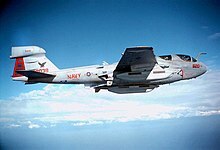 The EA-6B entered service with Fleet Replacement Squadron VAQ-129 in September 1970, and Tactical Electronic Warfare Squadron 132 (VAQ-132) became the first operational squadron, in July 1971. This squadron began its first combat deployment to Vietnam on America 11 months later, soon followed by VAQ-131 on Enterprise and VAQ-134 on Constellation. Two squadrons of EA-6B Prowlers flew 720 sorties during the Vietnam War in support of US Navy attack aircraft and USAF B-52 bombers. During the 1983 invasion of Grenada, four Prowlers supported the operation from USS Independence (CV-62). Following the Achille Lauro hijacking, on 10 October 1985 Prowlers from USS Saratoga (CV-60) provided ESM support during the interception of the EgyptAir 737 carrying four of the hijackers. Prowlers jammed Libyan radar during Operation El Dorado Canyon in April 1986. Prowlers from USS Enterprise (CVN-65) jammed Iranian Ground Control Intercept radars, surface-to-air missile guidance radars and communication systems during Operation Praying Mantis on 18 April 1988. A total of 39 EA-6B Prowlers were involved in Operation Desert Storm in 1991, 27 from six aircraft carriers and 12 from USMC bases. During 4,600 flight hours, Prowlers fired over 150 HARM missiles. Navy Prowlers flew 1,132 sorties and USMC flew 516 with no losses. With the retirement of the EF-111 Raven in 1998, the EA-6B was the only dedicated aerial radar jammer aircraft of the U.S. Armed Forces, until the fielding of the Navy's EA-18G Growler in 2009. The EA-6B has been flown in almost all American combat operations since 1972, and is frequently flown in support of the U.S. Air Force missions. In 2001, 124 Prowlers remained, divided between twelve Navy, four Marine, and four joint Navy-Air Force "Expeditionary" squadrons. A Joint Chiefs of Staff (JCS) staff study recommended that the EF-111 Raven be retired to reduce the types of aircraft dedicated to the same mission, which led to an Office of the Secretary of Defense (OSD) program memorandum to establish 4 land based "expeditionary" Prowler squadrons to meet the needs of the Air Force. Though once considered being replaced by Common Support Aircraft, that plan failed to materialize. In 2009, the Navy EA-6B Prowler community began transitioning to the EA-18G Growler, a new electronic warfare derivative of the F/A-18F Super Hornet. All but one of the active duty Navy EA-6B squadrons were based at Naval Air Station Whidbey Island. VAQ-136 was stationed at Naval Air Facility Atsugi, Japan, as part of Carrier Air Wing 5, the forward deployed naval forces (FDNF) air wing that embarks aboard the Japan-based George Washington. VAQ-209, the Navy Reserve's sole EA-6B squadron, was stationed at Naval Air Facility Washington, Maryland. All Marine Corps EA-6B squadrons are located at Marine Corps Air Station Cherry Point, North Carolina. In 2013, the USN planned to fly the EA-6B until 2015, while the USMC expect to phase out the Prowler in 2019. The last Navy deployment was on George H.W. Bush in November 2014, with VAQ-134. The last Navy operational flight took place on 27 May 2015. Electronic Attack Wing, U.S. Pacific Fleet (CVWP), hosted a retirement commemoration for the EA-6B from 25 to 27 June 2015 at NAS Whidbey Island. An EA-6B Prowler lands on the flight deck of the aircraft carrier USS George H.W. Bush (CVN 77). In 2007, it was reported that the Prowler has been used in counter improvised explosive device operations in the conflict in Afghanistan for several years by jamming remote detonation devices such as garage door openers or cellular telephones. Two Prowler squadrons were also based in Iraq, working with the same mission. According to Chuck Pfarrer in his book SEAL Target Geronimo, an EA-6B was also used to jam Pakistani radar and assist the 2 MH-60 Black Hawk stealth helicopters and 2 Chinook helicopters raiding Osama Bin Laden's compound in Operation Neptune Spear. The Department of Defense disputed certain aspects of his book, though not specifically the mention of EA-6B involvement. VMAQ-3 began flying Prowler missions against Islamic State militants over Iraq in June 2014. Once Operation Inherent Resolve began in August, VMAQ-4 took over. The Prowlers were the first Marine Corps aircraft in Syria and support strike packages, air drops, and electronic warfare requirements against militants. By January 2015, the five aircraft of VMAQ-4 had flown 800 hours during 110 sorties in support of operations in both countries, including supporting coalition airstrikes and providing EW support for Iraqi Army forces to degrade enemy systems. Marine Prowlers had not dropped munitions themselves and host nations basing them have not been revealed. In April 2016, a squadron of EA-6B Prowlers from Marine Corps Tactical Electronic Warfare Squadron 4 (VMAQ-4), based at Marine Corps Air Station Cherry Point, North Carolina, was deployed to Incirlik Air Base, Turkey for operations over Syria. U.S. European Command confirmed that the deployment was expected to last through September 2016. The Center for Strategic and International Studies suggested that the Prowlers may be used to prevent Russian and Syrian air defense systems from tracking U.S. and coalition aircraft. Prowlers of VMAQ-2 completed their last operational deployment to Al Udeid Air Base, Qatar in November 2018, and the squadron, the last equipped with the EA-6B, was disbanded on 8 March 2019, with its remaining two Prowlers being disposed of to museums. An EA-6B Prowler from VAQ-138 carrying two wing mounted jamming pods. The EA-6B Prowler has been operated by the U.S. Armed Forces with squadrons in the U.S. Marine Corps and Navy. VMAQ squadrons operate the EA-6B Prowler. Each of the three squadrons operates five aircraft; the squadrons are land-based, although they are capable of operating aboard U.S. Navy aircraft carriers and have done so in the past. In 2013, VMAQ-1 converted from an active to a training squadron as the USN stopped training on the Prowler and switched over to the Growler. The Marine Training squadron first received students for training in October 2013 and produced its first training flights in April 2014. In 2008, the USMC was investigating an electronic attack role for the Lockheed Martin F-35 Lightning II to replace their Prowlers. The Marines plan to begin retiring the EA-6 in 2016 and replace them with the Marine Air-Ground Task Force Electronic Warfare (MAGTF-EW) concept, which calls for a medium to high-altitude long-endurance unmanned aerial vehicle to off-load at least some of the electronic warfare mission. In November 2018, VMAQ-2 returned from performing the final deployed operations of USMC Prowlers. The Marines retired the aircraft on 8 March 2019, with some placed in storage and two headed to the Smithsonian National Air and Space Museum in Virginia and the Frontiers of Flight Museum in Dallas. While in U.S. Navy service four EA-6B Prowlers were typically assigned to a Tactical Electronic Warfare Squadron. These Navy Electronic Attack squadrons carried the letters VAQ (V-fixed wing, A-attack, Q-electronic); most of these squadrons were carrier-based, while others were "expeditionary" and deployed to overseas land bases. VAQ-134 Garudas 1972–2015 CVW-8 NAS Whidbey Island EA-6B replaced by EA-18G. VAQ-128: Established as an expeditionary squadron in October 1997, utilizing the insignia and heritage of the former A-6 Intruder Fleet Replacement Squadron at NAS Whidbey Island. Disestablished in September 2004 due to budget reductions. VAQ-309: Established as a Naval Air Reserve Force squadron at NAS Whidbey Island in 1979 with EA-6A aircraft, transitioning to the EA-6B in 1989 as part of Carrier Air Wing Reserve THIRTY (CVWR-30). Disestablished on 31 Dec 1994 following the decommissioning of CVWR-30 due to budget cuts; aircraft returned to the Regular Navy. While no Prowler has ever been lost in combat, nearly fifty of the 170 built were destroyed in various accidents as of 2013. In 1998, a memorial at Naval Air Station Whidbey Island was dedicated to 44 crew members lost in EA-6B aircraft accidents. On 26 May 1981, a USMC EA-6B crashed onto the flight deck of Nimitz and caused a fire, killing 14 crew men and injuring 45 others. The Prowler was running out of fuel after a missed approach ("bolter" in Navy parlance), and its crash and the subsequent fire and explosions destroyed or damaged 19 other aircraft. A USMC EA-6B Prowler, BuNo 163045, from VMAQ-2 struck the cables of a cablecar system in Cavalese on 3 February 1998, accidentally cutting the cables of a cableway in Italy during a low level flight in mountainous terrain, killing 20 people. The aircraft also suffered severe damage to its vertical stabiliser and wings as a result of striking the cable, but was successfully landed at Aviano Air Base. On 8 November 1998, a USN EA-6B landed on a Lockheed S-3 Viking during night landing qualifications on Enterprise; four crew members were killed. On 11 March 2013, a USN EA-6B of Electronic Attack Squadron VAQ-129 in Washington State, crashed during a training exercise. LTJG Valerie Cappelaere Delaney (Pilot), LTJG William Brown McIlvaine III (Flight Officer), and LCDR Alan A. Patterson (Instructor and Flight Officer) were killed. A year later, an investigation determined that the Prowler experienced a controlled flight into terrain that was due to pilot error. An EA-6B on display at the Patuxent River Naval Air Museum. An EA-6B Prowler on display at Tinker AFB in Oklahoma City. 158029 – EA-6B on static display at Naval Air Station Patuxent River in Lexington Park, Maryland. 158033 – EA-6B on static display at Patuxent River Naval Air Museum in Lexington Park, Maryland. 163886 – EA-6B on static display at the Wings Over the Rockies Air and Space Museum in Denver, Colorado. ^ "EA-6B Prowler". Warfighters Encyclopedia. Naval Air Systems Command. Archived from the original on 5 November 2004. ^ "EA-6B Prowler". Federation of American Scientists. 11 October 1998. Archived from the original on 5 December 1998. ^ "14 Die as Navy jet crashes into planes on USS Nimitz". The Miami News. 27 May 1981. ^ "Desert War Proved Need for Improved Arsenal". Gazette Telegraph. Colorado Springs. 5 December 1973. p. 8C. ^ "EA-6B Prototype". Naugatuck Daily News. 17 November 1966. p. 4. ^ a b Harvill, Brian (29 April 2005). "VAQ-141 'FrankenProwler' rejoins the fleet". Northwest Navigator. Archived from the original on 24 November 2007. ^ "U.S. Navy Awards Northrop Grumman $125 Million Contract to Produce Fourth Lot of Airborne Electronic Attack Systems" (Press release). Northrop Grumman. 29 September 2008. ^ a b c "EA-6B Prowler electronic warfare aircraft". USN Fact File. United States Navy. 5 February 2009. Retrieved 24 August 2015. ^ Bowers, Peter M. United States Navy Aircraft since 1911. Annapolis, Maryland, USA: Naval Institute Press, 1990, p. 274. ISBN 0-87021-792-5. ^ a b c Laur, Timothy M. (July 1998). Encyclopedia of modern us military weapons. Berkley Trade. pp. 63–65. ISBN 0425164373. ^ "Electronic Warfare: EA-6B Aircraft Modernization and Related Issues for Congress". congressionalresearch.com. 3 December 2001. ^ Book, Sue (13 June 2013). "Marines to assume EA-6B Prowler training". Sun Journal. New Bern, North Carolina. ^ "EA-6B PROWLER's FINAL PROWL". Archived from the original on 25 October 2014. Retrieved 2014-10-25. ^ Prowler Retires Following 45 Years of Naval Service, story NNS150630-18 by Mass Communication Specialist 2nd Class John Hetherington, U.S. Navy Public Affairs Support Element West, Det. Northwest, 30 June 2015. ^ "Navy Takes Aim at Roadside Bombs". Military.com. Military Advantage. Associated Press. 12 June 2007. ^ "Planes on the prowl for roadside bombs". CNN. 13 June 2007. Archived from the original on 12 June 2007. ^ SEAL Target Geronimo: The Inside Story of the Mission to Kill Osama bin Laden. Pfarrer, Chuck. Macmillan, Nov 8, 2011. ^ "Marine Prowlers deploy to Turkey for fight against ISIS". Marine Corps Times. 14 April 2016. ^ Burgess, Rick (April 2019). "Prowler bows out". Air International. Vol. 96 no. 4. p. 6. ISSN 0306-5634. ^ "E/A-6B Prowler". Northrop Grumman. Archived from the original on 17 March 2007. Retrieved 26 March 2007. ^ a b "EA-6B Prowler". Naval Historical Center. United States Department of the Navy. Archived from the original on 7 April 2007. Retrieved 1 January 2009. ^ "EA-6B Prowler". Intelligence Resource Program. Federation of American Scientists. Retrieved 26 March 2007. ^ Burgess, Richard R. (15 April 2014). "Marine Training Squadron Produces Its First Prowler Crews". seapowermagazine.org. SEAPOWER Magazine. Archived from the original on 16 April 2014. Retrieved 16 April 2014. ^ "Marine Tactical Electronic Warfare Squadron 1". United States Marine Corps. Archived from the original on 15 March 2007. Retrieved 16 March 2007. ^ "Marine Tactical Electronic Warfare Squadron 2". United States Marine Corps. Archived from the original on 11 March 2007. Retrieved 16 March 2007. ^ "Marine Tactical Electronic Warfare Squadron 3". United States Marine Corps. Archived from the original on 11 March 2007. Retrieved 16 March 2007. ^ "Marine Tactical Electronic Warfare Squadron 4". United States Marine Corps. Archived from the original on 15 March 2007. Retrieved 16 March 2007. ^ "Joint Strike Fighter (JSF) Transition Plan" (PDF). USMC. 15 May 2008. Archived from the original (PDF) on 15 May 2008. ^ . "EA-6B Prowler, one of the saltiest warfighters in the Marine Corps, retires". ^ "VAQ-129 Vikings". United States Navy. Archived from the original on 5 August 2008. Retrieved 6 August 2008. ^ "History – Electronic Attack Squadron 130". Electronic Attack Squadron 130. United States Navy. Retrieved 23 June 2012. ^ "VAQ-131 Lancers Command History". VAQ-131 Lancers. United States Navy. Archived from the original on 17 July 2008. Retrieved 1 January 2009. ^ "VAQ-133 official website". United States Navy. Retrieved 13 December 2015. ^ "VAQ-134 official website". United States Navy. Archived from the original on 10 August 2008. Retrieved 6 August 2008. ^ BURGESS, RICHARD (25 October 2014). "Navy Delays Formation of Expeditionary EA-18G Squadron". Seapowermagazine.org. Archived from the original on 25 October 2014. ^ "VAQ-135 official website". United States Navy. Archived from the original on 21 December 2008. Retrieved 6 August 2008. ^ "Northwest Navigator". United States Navy. Retrieved 3 July 2012. ^ "VAQ-137 official website". United States Navy. Archived from the original on 8 October 2008. Retrieved 6 August 2008. ^ "VAQ-138 official website". United States Navy. Archived from the original on 20 February 2011. Retrieved 11 April 2011. ^ "VAQ-139 official website". United States Navy. Archived from the original on 21 September 2008. Retrieved 6 August 2008. ^ "VAQ-140 official website". United States Navy. Archived from the original on 1 March 2009. Retrieved 6 August 2008. ^ "EA-18G Growlers to replace EA-6B Prowlers". United States Navy. 3 February 2012. Archived from the original on 16 October 2012. Retrieved 18 February 2013. ^ "VAQ-142 official website". United States Navy. Archived from the original on 10 October 2008. Retrieved 6 August 2008. ^ 49 losses from 1971 to 2013 by manual count from a list of bureau numbers with dates. ^ Offley, Ed (28 August 1998). "Memorial honors 44 EA-6B Prowler crewmen". Seattle Post-Intelligencer. Archived from the original on 16 May 2011. ^ Arendes, Ahron (29 May 2003). "Nimitz Remembers Lives Lost During 1981 Flight Deck Crash". USS Nimitz (CVN 68) Navy NewsStand. United States Navy. ^ Anderson, Kurt; Beaty, Jonathan (8 June 1981). "Night of Flaming Terror". TIME in partnership with CNN. Time. Retrieved 2 October 2008. ^ Gero, David (1999). Military Aviation Disasters. Yeovil: Haynes. pp. 131–132. ISBN 1-85260-574-X. ^ "Navy Flying Accident Leaves at Least 1 Dead". The New York Times. 10 November 1998. ^ "EA-6B Crashed ove E.Washington". Pakistan Defence. Retrieved 2018-07-24. ^ "Report: Deadly Navy Jet Crash Caused By Pilot Error". KBPS Broadcasting. 12 March 2014. ^ "Airframe Dossier – Grumman EA-6B Prowler, s/n 160786 USN, c/n P-73". Aerial Visuals. AerialVisuals.ca. Retrieved 11 August 2017. ^ "Airframe Dossier – Grumman EA-6A Intruder, s/n 147865 USN, c/n 2". Aerial Visuals. AerialVisuals.ca. Retrieved 11 August 2017. ^ "Airframe Dossier – GrummanA-6 Intruder / EA-6 Prowler, s/n 148618 USN". Aerial Visuals. AerialVisuals.ca. Retrieved 11 August 2017. ^ "Airframe Dossier – GrummanA-6 Intruder / EA-6 Prowler, s/n 149475 USN". Aerial Visuals. AerialVisuals.ca. Retrieved 11 August 2017. ^ "EA-6B PROWLER". National Naval Aviation Museum. Naval Aviation Museum Foundation. Retrieved 11 August 2017. ^ a b c d e f g h i j "EA-6B Prowlers on Display". VAQ136.com. Retrieved 11 August 2017. ^ "Airframe Dossier – GrummanA-6 Intruder / EA-6 Prowler, s/n 156984 USN". Aerial Visuals. AerialVisuals.ca. Retrieved 11 August 2017. ^ "EA-6B PROWLERS ON DISPLAY". Prowler Association. Retrieved 11 August 2017. ^ Shrum, Joy (2 December 2017). "New aircraft on the 'prowl' at Patuxent River Air Museum". TheBayNet.com. TheBayNet.com. Retrieved 2 April 2018. ^ "Airframe Dossier - Grumman EA-6B Prowler, s/n 158033 USN". Aerial Visuals. AerialVisuals.ca. Retrieved 3 April 2018. ^ "Airframe Dossier – Grumman EA-6B-45-GR Prowler, s/n 158810 USMC, c/n P40". Aerial Visuals. AerialVisuals.ca. Retrieved 11 August 2017. ^ "EA-6B Prowler". Pacific Coast Air Museum. Pacific Coast Air Museum. Retrieved 11 August 2017. ^ "Our Collection". Castle Air Museum. Retrieved 11 August 2017. ^ "Airframe Dossier – Grumman EA-6B Prowler, s/n 160436 USN". Aerial Visuals. AerialVisuals.ca. Retrieved 11 August 2017. ^ "Grumman EA-6B Prowler". The Museum of Flight. The Museum of Flight. Retrieved 11 August 2017. ^ "Aircraft Onboard". Midway's Aircraft. 8 March 2016. Archived from the original on 5 July 2017. Retrieved 11 August 2017. ^ "Grumman EA-6B "Prowler"". American Airpower Museum. 1 January 2013. Retrieved 11 August 2017. ^ "Northrop Grumman EA-6B "Prowler"". Hickory Aviation Museum. Hickory Aviation Museum. Retrieved 11 August 2017. ^ "EA-6B Prowler". Wings Over the Rockies Air & Space Museum. Wings Over the Rockies Air & Space Museum. Retrieved 11 August 2017. Wikimedia Commons has media related to Grumman EA-6 Prowler. This page was last edited on 29 March 2019, at 11:18 (UTC).